CH4: 97% CO2: 3% & H2S: Nil. Now the Raw Gas Enter in through composite bed of twin tower PSA module packed with special grade molecular sieves and activated alumina, which has a 5+5 minute time cycle. One tower is switched on to adsorption while the other is simultaneously regenerated by Vacuumed Pump. The cycle is repeated from tower which is in adsorption is now comes in regeneration and tower which is in regeneration which comes in adsorption and continuous Product Bio Gas will come out from the system. The entire operation, which is totally automatic, is controlled by a sequence programmer and quick change over valves. Bio gas of purity CH4 95 to 97% and CO2 Percentage 3 to 5 % & H2S Approximately Nil or traces Level. At 3000mmWc pressure. 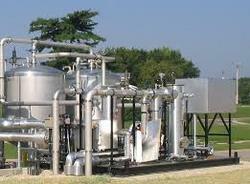 The produced by the PSA unit and it flows to a surge vessel to balance the fluctuations in pressure and concentration. Continuous, Supply and Guaranteed Purity.